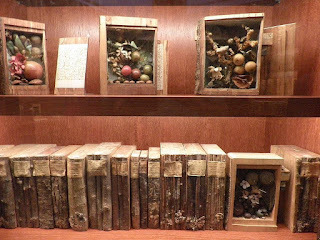 The intrepid explorers of Amusing Planet introduce us to a very special sort of “book” depository curated in locations across Europe and beyond that began with the advent of modern forestry in the eighteenth century. Botanists began forming libraries whose stacks contained wooden books that were compartments that held the twigs, fruit, root and bark samples of different sorts of trees—ξύλον being Greek for wood and θήκη a library. The word book in English itself is a cognate of the Germanic word for the beech tree, with early writing carved on blocks of wood. The pictured shelf is part of the Schildback Xylotheque located in the city of Kassel and there’s much more to be found at the link up top.